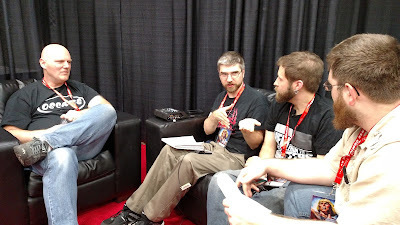 Host Anthony Desiato pulls up a chair next to two New Jersey comic book artists, Len Danovich and Nick Justus, to talk about the convention grind from the perspective of a creator. They discuss cost-benefit analysis (in deciding which shows to attend), fan interactions, and networking at shows. What better night than Halloween? Halloween is a safe time for mortals. The rituals of tricking and or treating keep the paranormal at bay. Doc Fluxx tends to the ritual chamber dressed as broccoli, surrounded by several piles of unread comics, virtually conjoined with the primary host of Super Podcasto Magnifico. A fine way for two wisened 30-somethings who love comics to spend the evening! Disclaimer: Of course I know who John Buscema is, I was screwing with Juan. The Inquisition of Juan Daeho! Music is clearly from a lot of horror movie soundtracks. Poltergeist, the Omen, The Shining, Tales From the Crypt, Phantasm 2 and so on. Sue me, I got nothing. I had the worst time editing this episode! I am currently using Audacity to edit the podcast and it crashed on me 13 times. If any of the listeners know of any free audio editing software that is more stable please let me know. Music by The Dropkick Murphy’s and the Grampian Police Pipe Band.